Hello and Welcome to my Patreon page, where my Numerology Course will take shape! My name is Kelly Proudfoot and I've been a practicing Numerologist for 30 years, since 1989. Like many creative types, I have a day job so I can pay bills and so on. Even though I get requests for readings, I'm not earning enough to quit my job and many people tell me that I should teach Numerology. Once I started planning the course, I realized that it would be a long and time-consuming process. It's not just writing and creating lesson plans, which will include graphs, charts and cheat sheets. There's video, workbooks, graphics and much more needed in order to get the course up and running - and that takes time and money - both of which are in short supply for me. I'm hoping to garner enough interest to be able to eventually teach Numerology and give readings full time. In the coming months, I'd love to be able to offer readings, access to my blog posts, share video from my Numerology course and use my patrons as "guinea pigs" - where they will have access to exclusive content and the opportunity to feed back and become a part of the creative process. Since I'm new to all this, I'll be updating and modifying the tiers according to any feed back I get and I'm hoping to start a Reddit community so everyone can chat about what they learn about their personal Numerology. I'm by no means a techno-dunce - more of a techno-chicken, so please be patient while I navigate this exciting endeavor! I’ve been practicing Numerology for 30 years now. It all started when I was living back in Melbourne, Australia. I saw an ad in the local newspaper where an American Psychologist was calling for students interested in learning Pythagorean Numerology, in an informal setting, for $7 per lesson on a weekly basis. Since then, I have given countless readings over the years and have developed my own style, incorporating Karmic Astrology and the Tarot to give my clients a deeper understanding of themselves and their lives. However, since I completed the course in 1989, I have oscillated between total belief in Numerology and Agnosticism and sometimes Atheism. Over the last three decades, I’ve had times where I thought I was attributing meaning to the numbers to suit and match my observations, so I could tie it all up in a neat bow. I soon arrived at the decision to test my knowledge and interpretation of Numerology by using hindsight. Doing my best to maintain a scientific approach, I looked back over my past and recent events to see if the numbers added up, without stretching my interpretations to fill in the blanks, like trying to ram a square peg in a round hole. I decided that if the results were less than 75% accuracy, Numerology was just another fanciful system used by gullible believers to either excuse bad behavior and justify patterns or a New Age time-waster, although Numerology has been around longer than the so-called New Age. My testing also included the incorporation of my knowledge of Karmic Astrology and the Tarot. I was delighted to discover that looking back over my life, Numerology and my other methods proved to be surprisingly accurate, without forcing or stretching the meanings. If there was something that didn’t fit or ring true, I made sure I noted it for future reference, where further enlightenment revealed the truth I couldn’t see at the time of review. I say all this to let you know that this course is intended to act as a springboard for further knowledge, development and understanding. I can’t guarantee that each and every student will come to the same conclusion when it comes to how they interpret their findings. It will depend on their background and motivations for doing the course in the first place. This includes religious beliefs, psychology and circumstances. This is the cover of my workbook that I am in the process of creating. 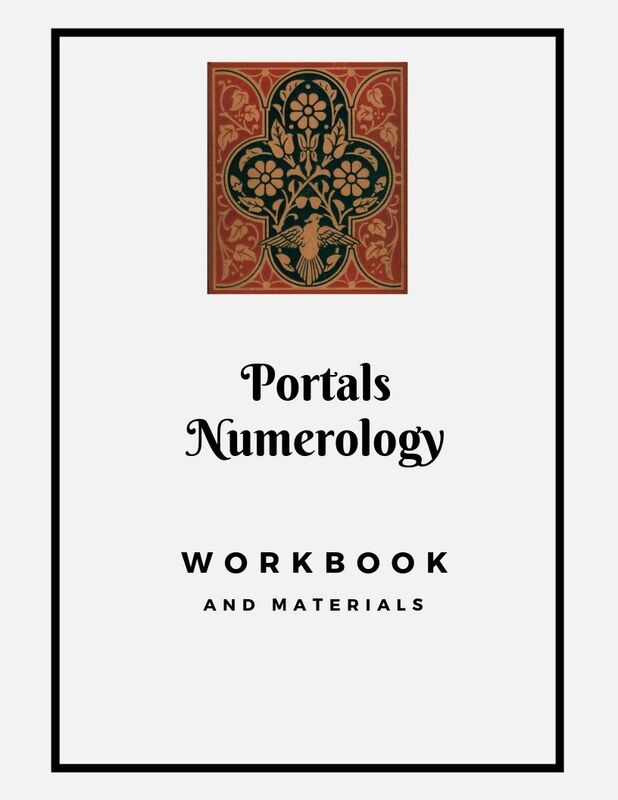 The name - Portals Numerology - is the name of my business, which I am still developing. The website already has several great posts and sample readings of famous personalities, however I have decommissioned it for now, due to the fact that I had to make cuts in order to make ends meet. Hopefully I will be able to get it back up soon and continue to offer great content that is informative and entertaining. I'd also like to offer my patrons discounts or full access to my Numerology course once it's completed. Check out my first blog post to see what modules will be included. Stay tuned!